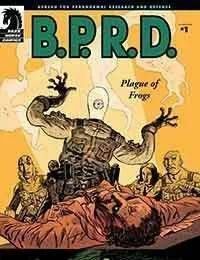 Here begins the epic miniseries B.P.R.D. : Plague of Frogs! A giant fungus escapes containment in a maximum-security laboratory, pitting the B.P.R.D. against the frog men they faced ten years ago in the original Hellboy series, Seed of Destruction. Following the success of Dark Horses B.P.R.D. one-shots, Mike Mignolas Bureau for Paranormal Research and Defense launches into the first of a five-issue miniseries. Drawn by Guy Davis, the artist of B.P.R.D. : Dark Waters, and written by Mignola himself, Plague of Frogs returns to the roots of the characters in this epic miniseries.